Richie and I talk about Rev. Major Jealous Divine, who was a man who did a lot of good for his community - he also thought he was God, pimped out women, and made a ton of money. 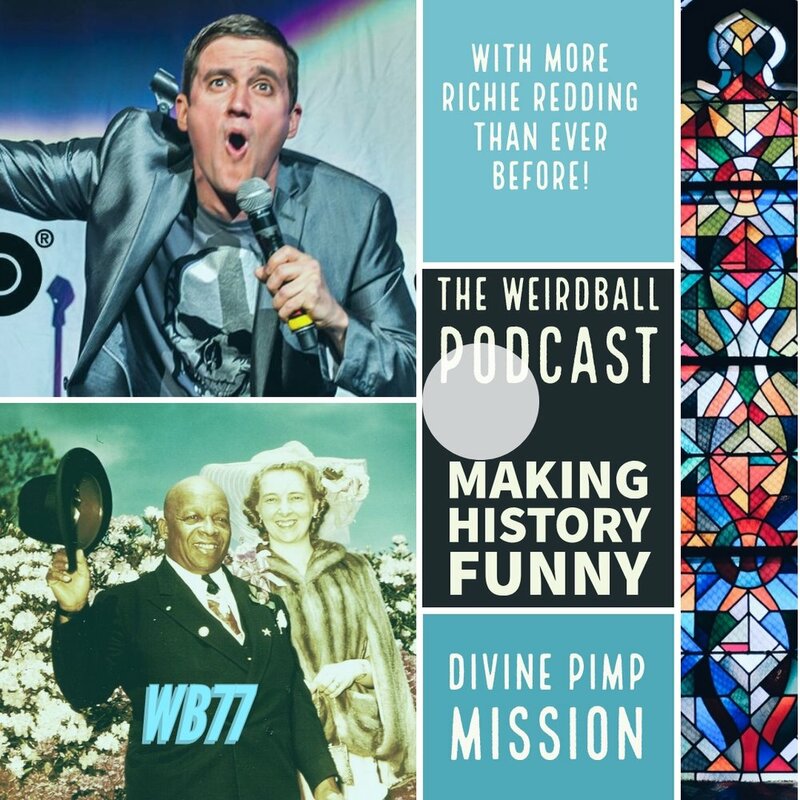 Richie Redding just released an album and has a great podcast, Pets and Punchlines. Richie Redding is one of the funniest guys that you’ve probably never heard of. As a graduate of the University of Pennsylvania it was unlikely that his comedy career start off in urban rooms and burlesque shows, but that’s how it happened. He left the corporate world determined to get paid to have fun which is obvious every time he takes the stage. His set is edgy, high energy and autobiographical, drawing on a lifetime of ridiculous true stories that can only happen to a recovering alcoholic Ivy Leaguer. His boy band looks and colorful word selection have gained him well-deserved attention. In 2012, he was selected to perform in Walter Latham’s Comedy After Dark and became a regular on HOT 97FM. In 2013 he beat out 32 comics from all over the world to win the Bermuda International Comedy Competition and also had his TV debut on AXS TV’s Gotham Live! He has headlined in six foreign countries and also had the honor of being selected to feature in a USO tour of South Korea, entertaining the 30,000 American troops stationed there. 2014 was a pivotal year, as he was hand picked by Katt Williams to be the official host of the Growth Spurt Tour and for the HBO special Priceless. Based on that success, Katt then asked him to be his featured act for the Born Again, Again Tour. His fanbase has grown rapidly since, as he was regularly killing crowds of 10,000 people or more! He continues to be a constant presence in New York’s top clubs, especially after command performances at both the Barclay’s Center and Madison Square Garden.